All the aspirants of the Govt Jobs in Meghalaya are taken a minute. If the opportunities available in the government jobs interest you then there is good news for you all. No the chances of you being selected in the Meghalaya Sarkari Naukri have increased. 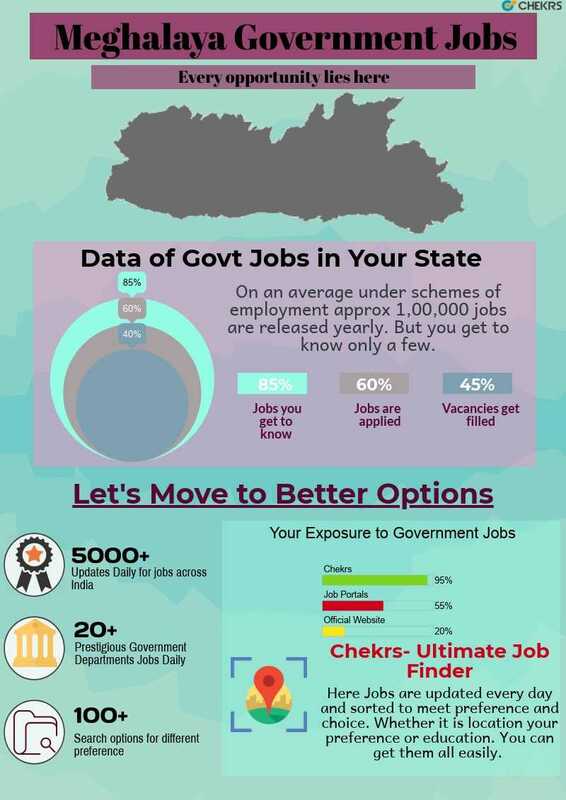 To help you explore from various options of Meghalaya Government Jobs Chekrs provides updates everyday from various different sectors such as research, education, security, management, armed forces, etc. We provide you the vacancies which brings you the contentment of having just the right choice in fewer efforts. To improve the chances of aspirants from every educational background the, here you can check out latest and well informed Jobs for Graduates, Engineers, MBA in Meghalaya. The options provided to you will be from different jobs across India for freshers and even experienced. You can allow receiving all the Meghalaya Latest Jobs along with the exclusive Upcoming Jobs in Meghalaya through subscribing the services of jobs.chekrs.com. Why Chekrs for Upcoming Meghalaya Vacancy? In the competition of thousands of candidates applying for every Govt Job in Shillong Meghalaya, you can stay ahead with the resources of Chekrs. To provide the best here you can find the papers from previous years, its sample papers and even the free online mock tests along with the quiz. These resources will help you improvise your practice and performance in a lot of ways.